Seven countries have laid claim to parts of Antarctica and many more have a presence there - why do they all want a piece of this frozen wasteland? It is the driest, coldest, windiest place in the world. So why, then, have Britain, France, Norway, Australia, New Zealand, Chile and Argentina drawn lines on Antarctica's map, carving up the empty ice with territorial claims? Military activity is banned, as is prospecting for minerals. Fifty states - including Russia, China and the US - have now ratified the treaty and its associated agreements. Science drives human investigation in Antarctica today, yet there's a reason why geologists often take centre-stage. Governments really want to know what's under the ice. Antarctic oil is extremely difficult and, at the moment, prohibitively expensive to extract - but it's impossible to predict what the global economy will look like in 2048, when the protocol banning Antarctic prospecting comes up for renewal. By that stage, an energy-hungry world could be desperate. The Antarctic Treaty has put all territorial claims into abeyance, but that hasn't stopped rule-bending. The best way to get a toehold on what may lie beneath is to act as if you own the place. One of the things nation-states do is stamp passports - so when Antarctic tourists visit the British station at Port Lockroy, they can have their passport stamped. This is despite the fact that international law doesn't recognise the existence of the British Antarctic Territory - indeed, both Chile and Argentina claim the same piece of land, and have their own passport stamps at the ready. Another thing states do - or used to - is operate postal services. At Ukraine's Vernadsky base, I wrote myself a postcard, bought a decorative Ukrainian stamp with a cow on it, and dropped it into their post box. It took two months to arrive - not bad, from the ends of the earth. All Antarctica's 68 bases are professedly peaceful research stations, established for scientific purposes - but the ban on militarisation is widely flouted. The Australian government recently identified China's newest base as a threat, specifically because of the surveillance potential. It said: "Antarctic bases are increasingly used for 'dual-use' scientific research that's useful for military purposes." Many governments reject Antarctica's status quo, built on European endeavour and entrenched by Cold War geopolitics that, some say, give undue influence to the superpowers of the past. 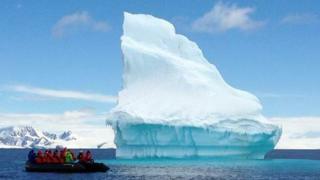 Iran has said it intends to build in Antarctica, Turkey too. India has a long history of Antarctic involvement and Pakistan has approved Antarctic expansion - all in the name of scientific cooperation. But the status quo depends on self-regulation. The Antarctic Treaty has no teeth. Faced with intensifying competition over abundant natural resources and unforeseen intelligence-gathering opportunities, all it can do - like my penguin - is squawk, and patter off into the snow.